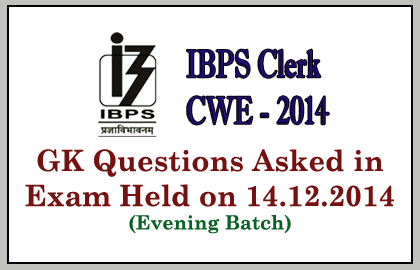 List of GK Questions Asked in IBPS Clerk IV Exam held on 14th December 2014 (Evening Batch). Candidates whose who are preparing for IBPS Clerk, SBI and other competitive exams can use it. Common Wealth Games 2018 will be held at? On whose birthday Sansad Adarsh Gram Yojna was started? Where the 18th SAARC Summit was held? Anirban Lahiri was related to which of the sports below? Who is the Minister of Skill Development& Entrepreneurship? When the International Day for Elimination of Violence against Women was observed? Where was the Headquarters of UNICEF located? What is the Constituency of Rajnath Singh? What is the goal of PMJDY? Sardar Vallabai Patel’s Birth anniversary was celebrated as?